Monitor footfall through doors, off escalators, out of lifts, down walk-ways and across squares. Show current occupancy on PCs and meters. Track visitor movements: where are people going? Use across many shopping centres. Count footfall both going past and into each retail unit. See which entrances and areas have the most traffic, and at which times of day. Give companies concrete data about where to place their vending machines, adverts or display booths for the most eyeballs. 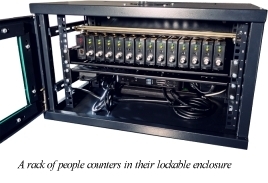 Racks of counting units can be hidden away in a cupboard or back office, or place smaller units in the ceiling. Find out more: get a quote, send us an e-mail or fill in the form below for more information on video footfall counters. Copyright ©Retail Sensing. All Rights Reserved.